Devi has a degree in Physics from Madras University followed by an MBA in Marketing and HR from IIM Kolkata. Her experience spans both the Market Research and HR fields. She has worked with AC Nielsen in their Mumbai, Chennai and Delhi Offices and has been involved with FMCG and Media Research. As a consultant, she has handled market entry strategies for Fruit Juice, Garden Furniture, Detergent Powders, Packaged Foods, Bread and Kitchen Knives. In the HR area, Devi has worked with HMT, Eicher Motors and Corn Products. She was the head of HR for KLG Systel. At present, she is an associate with Right Management since 2005, initially based in Sri Lanka and subsequently in India. She has worked on site with Clients for developing and implementing HR systems and leadership development of Middle to Senior Management. 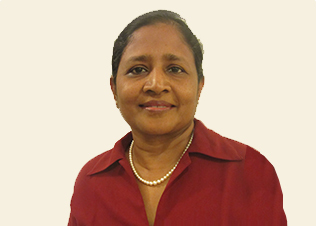 She has worked in individual Development Centers with several of the leading companies in Sri Lanka and India. Devi Muthu Bhatnagar is based in Delhi and is a Senior Advisor with YFactor.